Bazaartrading is a Research Advisory Company which basically provides, Commodity and Stock Market Advisory services since 2006. Our main motto is to build enduring client relationships and provide maximum profits to our clients through our ideal trade recommendations and tips. A genuine advisory for commodity and stock market trading recommendations. 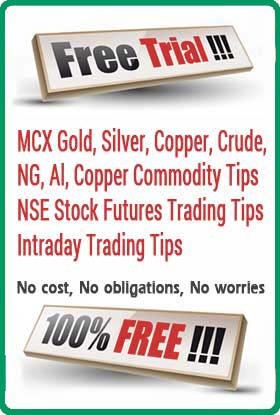 We offer MCX, BSE< NSE STOCK Markets Analysis, Buy & Sell Tips, Market Alerts, Local Bullion, Energy, Metals Market Rates, Daily & Weekly Support and Resistance levels, Latest news through SMS / Phone Call / Messenger / Website. Bazaartrading Advisory is a proud employer in M.P., India office. Over 50 professional sales analysts provide customer support to 10,00+ satisfied Bazaartrading subscribers across India and abroad. The research team is comprised of 10+ highly qualified analysts. Most analysts have over 5 years of market and research experience, hold MBA’s/CFA’s and are NCFM/NISM certified. Our analysts use their expertise and professional software tools, which facilitates them to forecast the moves in commodity and stock market on time which helps us in generating tips with a consistant accuracy rate of 80-90%. To maximize your profits, register for our 1-Day Free Trial Today or Subscribe any of our premium advisory.